How can you choose among the thousands of daffodils? Start with this list, for the daffodils that are first to bloom, and last to close out the season, with lots of lovelies in between. They offer a flower show through the entire daffodil season -- early, mid-season, and late bloomers. They perennialize well (they'll keep on producing baby bulbs over the years). They're Wister Award winners, recognized by the American Daffodil Society as both beautiful and reliable. Well, 9 out of 10 are Wister Award winners. I tacked on 'Rijnveld's Early Sensation' because it's always been the first to bloom in my garden. And when we're waiting for the beginning of spring, first to bloom means a lot. * Warmest zone listings are for the West Coast, where the summer temps are cooler than the Southwest or Deep South. Wondering which daffodils will succeed in your garden? Will 'Barrett Browning' thrive in your county? It's more than knowing a daffodil will bloom in "USDA zone 7", when zone 7 gardens can be found in the arid Sierra Nevada foothills, or in humid Washington, D.C.
Luckily, a past president of the American Daffodil Society wrote an article on regional daffodil favorites. 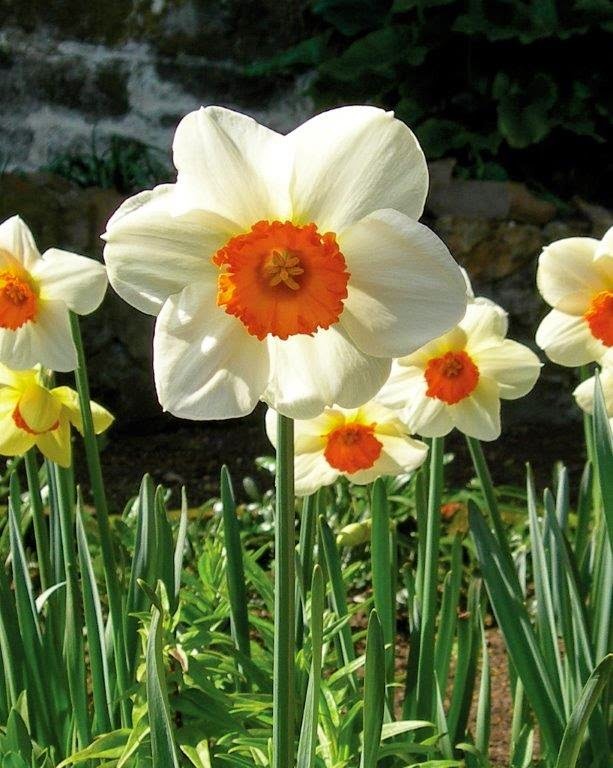 Click to read Mary Lou Gripshover's advice about "Daffodils: Regional Proven Performers" in the American Horticultural Society's magazine, The American Gardener. You'll find her suggestions for the Pacific Northwest, Southern California/South, the Upper Midwest/Mountain States, and the Mid-Atlantic. As well, she recommends bulb companies and bulb books. To read more in-depth articles like this, join the non-profit American Horticultural Society and receive the members-only magazine, The American Gardener. I was talking bulbs with Farmer Fred on his Get Growing with Farmer Fred radio show, Sunday, December 1 from 9:00 - 10:00 a.m. Listen to us on the podcast. I'm a garden writer, a California Master Gardener, and a daffodil nut. Here are links about topics we discussed on the December 1, 2013 show. How to plant daffodils: Choose a well-drained site that has full sun all year, or has full sun when the leaves are off the trees. Dig a trench or hole 6" deep, add phosphorus mixed with the soil at the bottom of the hole, add compost to the soil you have removed, plant the bulbs pointy end up, tuck tulips in next to them if you don't have deer, add 2 inches more amended soil then layer in small bulbs, add soil to bring the gently tamped-down soil even with the rest of the garden. Label the bed with the names of the bulbs. Do not water. Sources of phosphorus can be soft rock phosphate or bone meal if you have acid soil, and high P packaged guanos or worm castings if you have neutral or alkaline soil. Highly concentrated sources of phosphorus like Super Phosphate should be used with caution and applied only after reading the label carefully -- it is easy to over-apply these products and although phosphorus does not move vertically through the soil it does move laterally and excess phosphorus can lead to water pollution and algae bloom. Not all daffodils need to be pre-chilled for USDA zone 9; there are many daffodils that do well in warm climates. The Northern California Daffodil Society has excellent information about growing daffodils. NCDS organizes free daffodil shows each spring so you can see which bulbs you'd want to grow in your garden. Some of the members are busy hybridizing green daffodils. White daffodils to plant in the shape of a moon in Garden Valley, CA at 2,500 feet: 'Mount Hood' we mentioned but also consider 'Misty Glen'. Plant just one variety so that the blooms will show a solid, moon shape. For a piney area in Texas in USDA zone 8a, plant any daffodil but be sure the site is in full sun and is well-drained. Thanks for visiting. Please leave a comment and let me know what bulbs you are planting. Narcissus Nirvana is back with the 2012 Daffodil Blogorama (a round-up of blog posts about daffodils) and the annual meeting of the American Daffodil Society. If you're anywhere close to Towson, Maryland, rush over and revel in the flowers and fellowship at the Annual Meeting, April 20-22. For those of us who can't make the Annual Meeting, two quick glimpses of New Hampshire daffodils from my friend, Lynn Felici-Gallant. Lynn's combination of nodding Narcissus 'Thalia' and Veronica peduncularis 'Georgia Blue' in the New Hampshire garden Lynn left last year. That transition story was on a podcast with Andrew Keys at Horticulture magazine. Lynn is Merchandising & Marketing Manager here at the independent retail garden center and wholesale grower, Pick of the Planet, in Greenland, New Hampshire. * Enjoy the adventures of Mary "Moosey" planting daffodils with her horticulturally inclined kitten at Moosey's Country Garden in New Zealand. 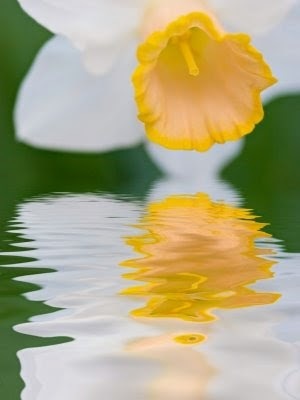 * Kathy Purdy of Cold Climate Gardening in New York fesses up with a romantic tale of why Narcissus poeticus is her favorite flower. * We love daffodils, but they don't love other flowers in vases. Joene Hendry delivers a horrible warning from Joene's Garden in Connecticut. * An ode to Narcissus 'Mount Hood', by yellow-dissing John Markowski who's An Obsessive Neurotic Gardener in Pennsylvania. * The Queen of Seaford, Janet, now reigns in South Carolina and is taking royal liberties by combining her daffs in arrangements with other spring flowers. 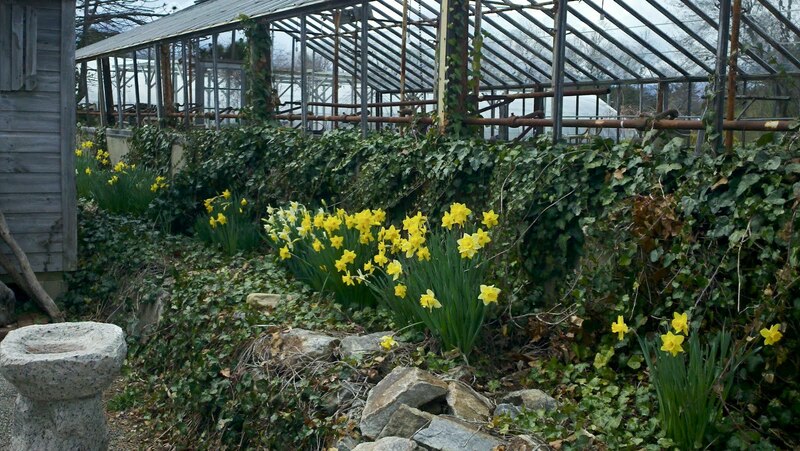 * Kate's Garden Journal from Ohio is on "D" for daffodil. Or should it be "F" for forcing? * Susy Morris at Chiot's Run in the Ohio countryside kindly created a charming daffodil parade for me. You'll love it too. * Tyla is a daffodil specialist at All About Daffodils in Alabama and she's breaking up with 'February Gold' in one of the funniest daffodil posts ever. Music video included! * Have you tried daffodils in containers? Tips for success from Debbie Teashon at Rainy Side Gardeners in western Washington. * Claire Splan wants to know just how pink a "pink" daffodil really gets in An Alameda Garden. * Wrap up with me, on a quick Daffodil Planter tour of Daffodil Daydreams weekend at famed Filoli. Thanks to all the bloggers for sharing their work! First Daffodils is now a Facebook page where people from all over the world send photos of the first sightings of daffodils in their towns. Order a daffodil note cube from them. If you can't attend the National Show this year, check out the American Daffodil Society website for answers to all your daffodil questions. Join the American Daffodil Society and a daffodil society near you. Cue the Dynasty theme music! Filoli was introduced to the world as the set for that wacky TV show, but these days there's not a diamond necklace or giant shoulder pad in sight. The Woodside, California garden is hailed as one of the most beautiful in the U.S. Filoli is an official Display Garden for the American Daffodil Society, and each spring it celebrates a long weekend of Daffodil Daydreams. A gracious transition from the formal gardens, looking West to the Santa Cruz Mountains, with daffodil accents. The daffodils in the borders and orchard were not at their peak, but daffodil containers, such as these lining the steps to a rear door of the house, made up for that. The garden pavilion known as the summer house or tea house was in on the daffodil celebration too! The Northern California Daffodil Society set up tables of information about daffodils; their nationally known experts gave lectures and garden tours. The NCDS flower display provided a close look at the range of daffodils that do well in this part of the world. Under the Chanticleer rooster weathervane, the former garage was charming with more pots of daffodils. Yes, even those double daffodils looked good to me. I must have been distracted by the contents of the building (as you can see from the sign below). More on that next time! Announcing the Daffodil Blogorama winners! What if John Grisham were a garden writer?